Although the long-term economic impact of the tournament to Brazil is still yet to be confirmed, one thing is definite – the 2014 World Cup has delivered the most technologically advanced sporting experience of any large-scale event – globally. The innovation pioneered at the 2014 games has revolutionised the accuracy and efficiency of the sport itself, transforming the experience for players, stadium spectators and global observers, not to mention local communities and economies impacted by the $14billion event. Ranging from the World’s most advanced police safety suits, to apps that help visitors to Brazil to save money, a new research report from U-Start – the international tech’ investment advisory firm – details the innovation unveiled at the games, the majority of which has never been seen before. 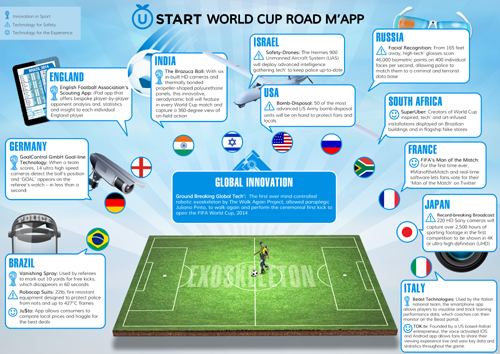 The U-Start World Cup Road M’App – which includes an infographic and an in-depth research report – investigates each global contribution that has defined the 2014 iteration of the event, outlining the origin, concept and future facing impact of the technology. The research initiative analysed the technology in three sections: Innovation in Sport, Technology for Safety and Tech’ for the Experience. U-Start – which specialises in partnering emerging market technology firms with Western investment – positions the innovation to emerge from global territories – as the core premise of its global offer. With €3.8bn in finance under management and seven worldwide locations, the firm champions a globally relevant, funding focused spotlight on emerging market technology, an objective the World Cup 2014 is sure to support.